Welcome to the free New Jersey and New York Calendar with info on the top Art Festivals and Craft Shows in New York City, Buffalo, Syracuse, Tarrytown, Morristown, Montclair and many more. Please join us in supporting the nation's fine art and craft show events, and the artists who make them possible. 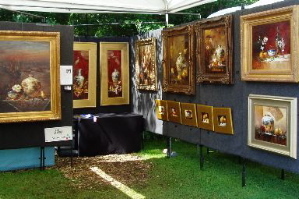 Please join our Art Fair Calendar email list to be notified about updates on art shows. An international showcase of artists and styles, including: painting, prints, sculptures, photography, animation and decorative art. You will love the utter civility of this setting. 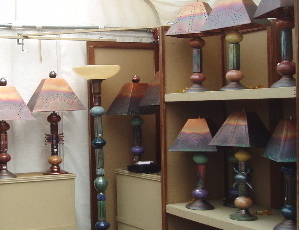 Shop for American-made art and crafts around the square of the Chautauqua Institution, small enough for intimacy, large enough for variety. Rochester's premier summer Festival! Become part of the 51st Annual Juried Arts Festival! Our 350 original arts and crafts people love this event. We offer large crowds, tree-lined streets, street managers, free parking and electric hook up if needed. Columbus Circle, 259 East Onondaga St.
What a great excuse to make a trip to the Chautauqua Institution! Organized by a local art group to exploit this fabulous setting and to exhibit the finest examples of work in a variety of media. 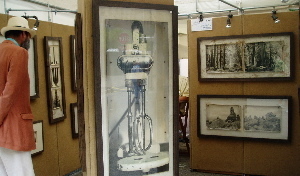 Talented artists and craftsmen from around the country are encouraged to apply for the shows, held in the unique setting of the over 140-year old Chautauqua Institution. Rte. 27 & Edgemere Ave. Presented by Rose Squared Productions, Inc. Celebrating its 41st anniversary, this event is sponsored by the local Kiwanis Club and they really know how to do it right! Hello Rasul, What do you mean, is this a current list? Are you asking if these shows are being held in 2019? Yes, any show with an asterisk has had the show dates for 2019 verified. And shows that do not have the asterisk have not been verified yet. I verify them as soon as I can find updated dates. Any show that can't be verified will be removed. Hope that helps. Is this a current list? Simon, thank you so much for letting me know about this. Many times I have to hunt and hunt for this information. I really appreciate that you let me know this. Due to impending construction at the American Museum of Natural History, the CRAFTS ON COLUMBUS event is suspended – possibly until construction is completed. We will keep you posted as to when it is possible to hold this event again at this location. If you want to have a show listed on the Art Fair Calendar you will have to submit it. Copy and paste this into your browser, scroll a little ways down the page and you will see the info on submitting your show to be included on the Art Fair Calendar. Hello Lisa, No, the shows on our calendar are not our shows. We just list them. If you want to sell your art work you need to contact the shows and apply to get into them. That is how it works. Hello, I was wondering if I could bring my paintings to your shows or are you artists already chosen? Hello Joanie, Thanks for letting us know that you have set your 2016 show dates. I have updated your show on our New York & New Jersey page. I wish your show the best. I see the Corn Hill Arts Festival held in Rochester NY in July is listed for 2016, but still has the 2015 dates. All current information was submitted and paid for - can you update to the correct information? Hello Cassie, Yes, I have not updated the Armonk Outdoor show yet. We have a notice on the page that states at what point the calendar has not been updated as of yet. I try to do my best and have the calendar updated at least 6 months out. Shows rarely contact us with their show dates so I have to hunt for all the dates myself. As you can see, we have a lot of shows on our calendar. I will update that show though right now with those dates. Thanks for your help. happening on Sept 27- 28. Hello Soufiane. I am sorry I don't understand your question to give you an answer. Could you please submit your question again and I will try to help you. Hello everyone I need to know what international fairs craft & gift in new york and the international fair of fashion in new york "please the trade fairs and is not tradeshows "Thank you very much.